Away back in the year 1869 two of Winnipeg's prominent citizens had an experience, the like of which has never been known before or since in these parts. They witnessed the refusal of entry into Manitoba of the man who was to have been the first Lieutenant-Governor of the North-West Territories, which of course included Manitoba. Hon. William McDougall, together with aides, Council and others came with pomp and ceremony from Ottawa through the northern states. At that time the railway did not run further north than St. Paul, Minn. The remaining 500 mile journey over prairie trails was made by Red River carts, prairie schooners, horse and buggy or on horseback. A Red River cart train required six to eight weeks to cover the distance to Winnipeg. The McDougall party reduced the time by travelling first class with fine teams and double seated buggies. Canada had purchased the land known as the North-West Territories, or Rupert's Land, from the Hudson's Bay Co., but the formal transfer had not been made. Hon. 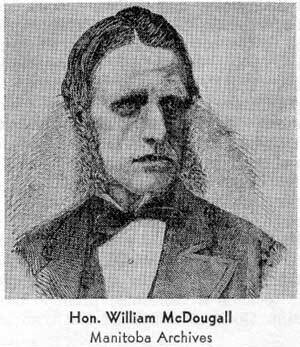 William McDougall had been named Governor at an annual salary of $7,000, the appointment to take effect after transfer of the territory had been completed. He was directed to proceed to Fort Garry with as little delay as possible, and on his arrival to get in touch with William Mactavish, Governor of Rupert's Land, with a view to dealing fairly and justly with all classes. It was unfortunate that the inhabitants here had not been made fully aware of the intentions of the Canadian Government. The French Metis especially, viewed with alarm and distrust the appointment of a new style of government. It would seem natural, therefore, that they would take steps to stop the "invasion" of the territory which to their minds had been governed satisfactorily. In the words of one historian of the period - C.R. Tuttle, "Added to this the resident officers of the Hudson's Bay Co. were very lukewarm in their support of the proposed transfer, and while not openly disaffected, were certainly indifferent as to the success of the under-taking. They felt that their joint and individual interests had not been provided for by the Directors of the Company in London, who cared very little for anything except getting as much money as possible out of Canada, and they took no trouble to explain to the people the intentions of the Dominion Government after the transfer had been completed". "The Hon. William McDougall, when leaving for his new post early in October 1869 was accompanied by his family and several gentlemen who had been appointed members of the new council, among whom were Messrs. A. N. Richards (Attorney General), J. A. N. Provencher, (Territorial secretary) and Captain D. R. Cameron. Mr. McDougall also took with him three hundred rifles and plenty of ammunition, the government being apparently impressed with the idea that the slightest show of force would be sufficient to check any discontent, or prevent any trouble. In this, however, they showed the same want of wisdom displayed throughout the whole negotiation for the transfer, and in-stead of Mr. McDougall's three hundred rifles frightening the French Half-breeds, they only made them more determined not to permit the Canadians to enter Assiniboia and set up a new government until they (the Half-breeds) had been consulted in the matter and guarantees given them that their rights would be respected." In a letter dated October 31, 1869 from Mr. McDougall to the secretary of State, Ottawa, he stated that "rumours of hostile movements on the part of the French Half-breeds against the authority of the Canadian Government reached me at several points between St. Paul and Pembina, but they were so wild and contradictory that I gave little heed to them." One of the most noted and highly respected Winnipeg merchants was returning from St. Paul in charge of a train of carts, during the time that Mr. McDougall's party was on the same trail. His name, William Gomez Fonseca, is still remembered in Winnipeg by a north Winnipeg street named Gomez. It might be mentioned also that the C.P.R. yards from Point Douglas to Sherbrook St. was at one time Fonseca Street. In a paper given to the Manitoba Historical Society by Mr. Fonseca in January 1900, he gave a brief resume of the trip above mentioned. He had seen the McDougall party coming north. "Nearing Pembina, the governor expectant, family and suite gave us the go-by ... They arrived at the Hudson's Bay Co. post October 18th." On the 19th Mr. Fonseca set out, leaving the train of carts, loaded with government household furniture and supplies at Pembina. With him were Dr. J. H. O'Donnell, his wife and two children. Upon their arrival at the home of a friendly half-breed they were informed that one train of Mr. McDougall's carts had been seized at St. Norbert and that they were on the qui vine for Fonseca's. Also that twenty men would be at Pembina the next day to turn back Mc-Dougall and his men. Next morning, Mr. Fonseca called on McDougall and gave him the information he had received, and volunteered some advice respecting the government's goods. Fonseca was quite convinced the train would be seized. From what has been written in various historical documents, it seems abundantly clear that McDougall was a very arrogant individual, with a profound sense of his own importance. Mr. Fonseca states "I supposed that I had made my report to a sensible and judicious gentleman, but was egregiously mistaken, as the sequel will show. In my good offices the governor-expectant interpreted treachery, as stated in one of his North-west reports; he writes: "The person in charge of the government train called upon me and gave me such information as convinces me that if he is not in the pay, he is in the confidence of the insurgents.' Mr. McDougall rose from his seat, drew himself up to his full height and struck an imposing attitude, as with outstretched arm and rigid finger, he ordered the train to proceed on the Queen's highway, declaring that he would see that no half-breed dare molest it. That was the last he ever saw of the train or its elegant freight. The melodrama of the Big I and the Little u ended, I bowed myself out, regretting 'Love's labor lost'." There were thirty-six carts and the drivers lost no time in moving along as it was getting late in the season and they were anxious to get home. Mr. McDougall's report written at Pembina, November 4th, 1869 is as follows: - "On the 2nd inst., a body of armed half-breeds galloped up to the Hudson's Bay Co. post, and demanded an audience with me, two of the leaders were admitted, and told me they had been sent to order me out of the North-West Territory. They said I must leave by 9 o'clock next morning. I explained my position, but they were evidently very ignorant and had come for one object; - viz. to compel me to leave the Territory. In the morning they appeared at the gate with arms in their hands, and loudly demanded that we should leave, as after 9 o'clock they would not answer for our lives. We accordingly put our horses to our wagons, and drove across the line, accompanied by a portion of the party with arms in their hands." The dealings of Mr. McDougall and members of his party, subsequent to what is herein written is another story - a story which has been written on many occasions. Suffice it to say, Hon. William McDougall returned to Ottawa in due course.